As the 2012-2013 season begins there are questions for each team in the Atlantic Division that need to be answered. The Atlantic is, arguably, the best and deepest division in the Eastern Conference. With stiff competition throughout, who will come out on top? New York Knicks – Will the Knicks aging bench catch up with them at the end of the season? So far, the Knicks have not shown much age at all. In fact, the team looks younger than they have in year. The Knicks stand as the only unbeaten team remaining in the league and have a point differential of 15.6 points per game, the highest in the NBA. Their defense has shown more grit under Mike Woodson than it ever did during the Mike D’Antoni run-and-gun era. Carmelo Anthony is beginning to show that he’s more than just a scorer and has made strides in improving his all-around game. Look for the Knicks to finally put all their talent together and finally make a deep run in the playoffs. Brooklyn Nets – Are the Core 4 built for a deep playoff run? At first glance, the Nets made great moves this offseason in hopes of making their inaugural season in Brooklyn a successful one. However, they invested in a window that is rapidly closing. By missing out on the Dwight Howard sweepstakes, the Nets ended up investing $35.3 million in Gerald Wallace, Brook Lopez, and Kris Humphries for this season, taking Joe Johnson’s remaining $90 million, and inking Deron Williams for another $100 million. Needless to say, the Nets haven’t given themselves much wiggle room over the next couple seasons. In my opinion, the only elite caliber player in that bunch is Williams, but they are paying each of them elite caliber money. Joe Johnson has, by default, been considered a top 5 shooting guard in this league, while still never really being the go-to-guy in Atlanta. Lopez is an atrociously bad defender and has improved very little in that aspect since entering the league. Humphries is a consistent double-double kind of guy, but not worth the money he’s being paid. And Wallace is beginning to fall past his prime and could be easily be replaced by a younger, cheaper swingman. While this season has promise looking forward, look for this franchise to implode 2 or 3 years down the road as they go way above the luxury tax. Philadelphia 76ers – Will Andrew Bynum be able to make a difference in his first year in Philly? So far this season, we have yet to see Andrew Bynum suit up for the Sixers. It may be around Christmas time before we do, and what a Christmas present that would be for the fans in Philly. In the meantime, the Sixers have won 3 straight and have shown they can be a competitive team without Andrew Bynum, thanks in large part to the play of Jrue Holiday, who is playing at an elite level so far this season at point guard. Boston Celtics – Will the new Big 3 make another title run? I’m going to go out on a limb and say that you may never find a bigger Rajon Rondo fan than me. 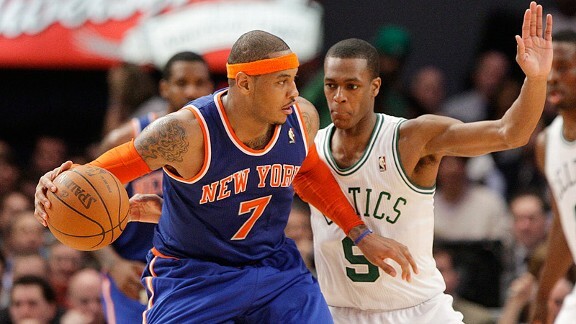 Rondo has single-handedly extended the success of Allen, Pierce, Garnett and the rest of the Boston Celtics since they won a title back in 2008. This season he’s poised to be in contention for the MVP while also keeping the Celtics in title contention. Look for the revamped Big 3 of Rondo, Pierce and Garnett to present a strong challenge to Miami, New York and Indiana for contention in the East. Toronto Raptors – Can Kyle Lowry help the Raptors bully their way into the playoff mix? While many believe that Lowry is the missing piece to propel this Raptors team to the postseason, I don’t see enough proven talent on this roster for this to be their year. That said, they certainly will be right in the mix. After a 1-5 start, Lowry is currently leading the team in each major statistical category except blocks. You definitely have a toughness problem if your point guard is the one leading your team in rebounds. Expect the Raptors lack of depth and soft playing style to keep them out of the postseason for another year. This entry was posted in Basketball, National, Uncategorized and tagged Andrew Bynum, Boston Celtics, Brooklyn Nets, Carmelo Anthony, New York Knicks, Philadelphia 76ers, Rajon Rondo, Toronto Raptors.